Earlier in the new Pokémon TV anime series, Pokémon: Sun Moon, Ash was shown as a wimp. He’s always been superhuman strong, so this depiction was a break from tradition. Good news! The most recent episode is a return to form. Herculean Ash is back and stronger than ever. 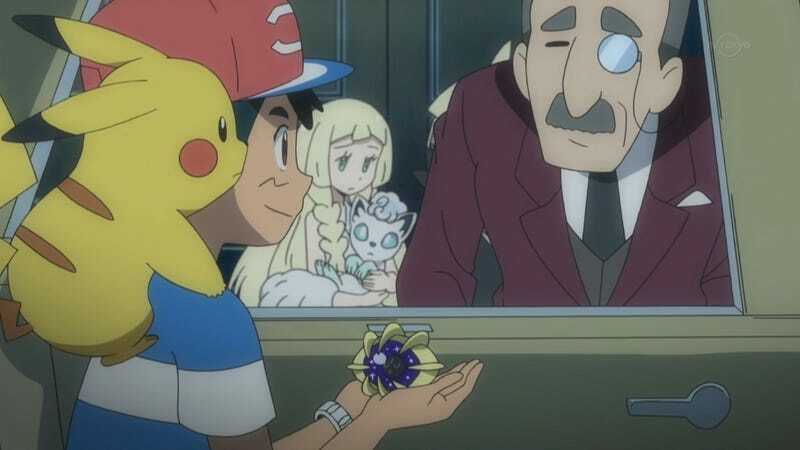 Over the years, the Pokémon anime has shown Ash pick up an array of hefty Pocket Monsters. Those characters look heavy, but unless you were familiar with the Pokédex, the most recent feat probably won’t appear impressive. Ash is holding Cosmoem, a small Pokémon, with ease. Well, Cosmoem weighs 2,204.4 pounds (999.9 kg), making this the heaviest Pokémon Ash has ever lifted. Look how easily he does it! To put this in context, Cosmoem weighs as much as Celesteela, so it’d be like Ash is holding that massive Pokémon no sweat. Obviously, this isn’t to scale. Celesteela is a little over 30 feet tall. Wait a minute... Why couldn’t he move Snorlax back in the day? But Ash isn’t the only one with incredible strength. I’m beginning to think that Pokémon isn’t very realistic.